A few weeks ago, Trump puzzled African American leaders with comments strongly suggesting that he thought that Frederick Douglass was still alive. Yesterday, Education Secretary Betsy DeVos characterized historically black colleges and universities (HBCUs) as models of school choice, which a Howard University historian said was "a bit crazy." That all blew up when the decision was made to take the presidents to the Oval Office to see the President. I’m still processing that entire experience. But needless to say that threw the day off and there was very little listening to HBCU presidents today- we were only given about 2 minutes each, and that was cut to one minute, so only about 7 of maybe 15 or so speakers were given an opportunity today. The Republican Party has been botching African American outreach for decades. The president-elect has shared with me, over a long period of time now, his desire to see the party broaden, to broaden its base, and to bring additional people in. He has led by example in this regard here in the state of Texas. He's made it clear that this is the goal that he wishes that the party to achieve, to bring more people in from the Hispanic community, the African-American community, all regions of the United States of America, and to make this party broader even than it is now. I understand that the pull of partisanship is strong. But such justifications ultimately underscore the moral and intellectual decay that has spread as a result of Trump and Trumpism. Many people on the right, in choosing to support Trump over Hillary Clinton, began to accommodate themselves to their decision. They began the process of normalizing Trump, and normalization is now giving way to loyalty. They are now following his lead. What they once found unacceptable is increasingly tolerable. Donald Trump is now steering this ship, so why not relax and come along for the wild ride? Events, including the new administration's own ratio of competence to incompetence, will ultimately determine how successful Trump and his aides, including Steve Bannon and Steve Miller, are in realizing their ambitions. In the meantime, some of us will continue to resist their efforts to transform conservatism into an ethno-nationalist, blood-and-soil movement, one animated by grievances and a Nietzschean ethic. And those on the right who are making their accommodation with Trump might reflect for a moment on the words of Edmund Burke, who wrote that certain means, once tolerated, are soon preferred. The far bigger danger that [David] Horowitz and other pro-Trump conservative intellectuals are in denial about is our new president’s uniquely flawed character, his ignorance of the world and his evident incompetence to organize an American government now facing acute and unprecedented worldwide challenges. In his 1953 anti-totalitarian classic, The Captive Mind, the Czech writer Czeslaw Milosz described how European intellectuals betrayed their commitment to thought and truth for the illusion that their utopian hopes for change might be satisfied by real communism in power. In the early days of the New Left, Horowitz recognized that this age-old dream of a better world could easily be corrupted when it was attached to state power and a demagogic party leader using the big lie technique. A half century later, in the strange case of Donald Trump, Horowitz has fallen for the same illusion he once warned against. I am convinced this will end badly for our country, but it’s almost as disturbing that it will end badly for the once idealistic conservative movement in America. This time, when the dreams of radical change fall apart, there will be no redemptive moment as in The God That Failed for Horowitz and his fellow Trump intellectuals. It will, instead, be transparently pathetic and shameful that men and women of intellect and ideas served as a bodyguard of lies for a low-life con man who managed to disgrace the American presidency. In his meandering 48-minute speech, Trump did not once use the words “liberty” or “constitution.” He did not invoke the name of Ronald Reagan, the last Republican president to address CPAC during his first year in office, and to whom he was incessantly compared throughout the week. He made no reference to “government,” in terms of keeping it small, limited or otherwise. And the only time he uttered the word “conservative” was in reference to his triumph at the ballot box. “Our victory was a victory ... for conservative values,” Trump declared. To Trump—and to his chief strategist, Steve Bannon, who appeared on a Thursday panel alongside chief of staff Reince Priebus—this means pursuing an agenda of “economic nationalism” that, among other things, restricts trade, subsidizes certain domestic businesses and borrows and spends large sums of money to spur job growth and wealth creation. None of this is remotely compatible with the modern conservative movement, which has been defined to a large extent by its adherence to the principles of free trade, free markets and fiscal restraint. I know there are some who want to turn back, who want to return to the more insular and isolationist days of old. I vetoed the trade bill last week because I don't believe we can or should turn back. Critics of our policies complain that, on one hand, America is, as they say, "exporting jobs," which is to say our companies invest overseas, and on the other hand, that America is "selling itself to foreigners," which is to say that foreign companies are investing here. Put it together, and what they're really saying is "turn back." The isolationism of their foreign policy walks hand in hand with the isolationism of their economic policy, and both will lead us to disaster. Contrast that with what President Trump said Friday when he addressed the Conservative Political Action Conference. Trump’s speech, coupled with the appearance a day earlier by White House chief strategist Stephen K. Bannon, provided the most definitive articulation of the “America First” philosophy that carried Trump to victory in November and that is redefining conservatism and, with it, the Republican Party. That too is a contrast between the 40th president and the 45th. "This Is Not the Intelligence Assessment the President Asked For"
The report, reviewed by The Wall Street Journal, came from Homeland Security’s Office of Intelligence and Analysis. It said that its staff “assesses that country of citizenship is unlikely to be a reliable indicator of potential terrorist activity.” The White House on Friday dismissed it as politically motivated and poorly researched. “The president asked for an intelligence assessment. This is not the intelligence assessment the president asked for,” a senior administration official said. The official said intelligence is already available on the countries included in Mr. Trump’s ban and just needs to be compiled. The decision to involve those officials could be perceived as threatening the independence of U.S. spy agencies that are supposed to remain insulated from partisan issues, as well as undercutting the credibility of ongoing congressional probes. Those officials saw their involvement as an attempt to correct coverage they believed to be erroneous. GOP members thought they had a choice between defeat & dishonor. They chose dishonor & now, unless they change course, they'll have defeat. Ed Schultz speaking at the Conservative Political Action Conference would have been inconceivable a year ago. But Donald Trump is president now, and his brand of protectionism is having its moment. On his MSNBC show in 2009, Schultz said that “there are parallels” between “some of the things Hitler was saying and some of the things that were at the CPAC convention.” He added, “They are not Americans.” In 2011, per CNN, Schultz called Trump a racist and said “nobody” wanted him to become president. Schultz now hosts a nightly show on RT, which is a propaganda arm of Russia and funded by the Kremlin. At what for decades has been the signature cattle call on the right, he praised Trump as someone who “is not bought and paid for by anyone.” Then he expounded on what he sees as the horrors of the Trans-Pacific Partnership and NAFTA. No one booed. Instead, heads nodded. The times, they are a changin'. The administration had sought to push back against reports from CNN and the Associated Press that chief of staff Reince Priebus had asked the FBI’s top two officials to refute news reports about Trump allies’ ties to Russia. But in doing so, the White House on Friday acknowledged that Priebus, FBI director James Comey and deputy director Andrew McCabe had discussed what the FBI knew about Russian ties to the Trump presidential campaign. “The White House appears to have violated accepted protocols and procedures”, said former FBI special agent Ali Soufan. Another retired FBI special agent, Michael German, said the FBI leadership had potentially jeopardized an investigation. There is no guarantee that the Democrats can put the House in play, even if Mr. Trump’s approval ratings remain as low as they are now or slip further. The Republicans have so many safe seats that they could even survive a so-called wave election like the ones that swept Democrats to power in 2006 and out of power in 2010. The Democrats need 24 seats to retake the House. But whether the Democrats can do it will come down to places like Orange County, which is more populous than Iowa. Four congressional districts that have at least some territory in the county still have Republican representatives, and all four were carried by Mrs. Clinton. It’s not much of an exaggeration to say that the road to a Democratic House begins and ends at Laguna Beach. Darrell Issa, who represents the California coast from southern Orange County almost to La Jolla, is probably the nation’s most vulnerable incumbent. That’s based on factors that tend to predict which districts are likeliest to be competitive — like the result of his last election (he won by just 1 point) and how the district voted in recent presidential contests. By the same measures, the 24th-most vulnerable Republican is Dana Rohrabacher, whose district is immediately north of Mr. Issa’s — stretching up the Orange County coast from Laguna Beach to Sunset Beach. In between, Ed Royce and Mimi Walters represent the 13th- and 20th-most vulnerable districts. But Orange County is not an outlier. Across the nation, the most vulnerable Republican incumbents among the 50 or so most competitive seats tend to be in relatively well-educated, metropolitan districts with above-average Hispanic populations. It’s the opposite of most of the 2016 presidential battleground states, which were whiter, less educated and far less Hispanic than the country as a whole. The Iron Law of Emulation is at work. In 2009, liberals complained about astroturf protests at Democratic town halls, pointing out that the protesters had written guidelines. After decades as the crossroads of prairie populists and checkbook conservatives, Iowa has suddenly become solidly Republican like many of its Midwestern neighbors. It was one of four states — along with Kentucky, Missouri and New Hampshire — that flipped to complete GOP control in the November election, but Iowa's rush of new legislation has been the most intense. In an all-night session last week, Iowa lawmakers approved a bill similar to one enacted in Wisconsin six years ago that strips most public sector unions of long-held collective bargaining rights, including health insurance. Jeff Orvis, a veteran northern Iowa high school teacher, said he sees the measure leaving permanent damage to Iowa's century-old reputation for quality schools, enshrined on the state's 2004 commemorative quarter: "Foundation in education." "Now, I don't even see how Iowa is going to attract good teachers," said Jeff Orvis, a union representative from northern Iowa. "That's my biggest worry." Daily Kos Elections’ project to calculate the 2016 presidential results for every state legislative seat in the nation hits Nevada, a rare Democratic bright spot in 2016. You can find our master list of states here, which we'll be updating as we add new states; you can also find all our data from 2016 and past cycles here. Hillary Clinton carried the Silver State 48-46, a drop from Barack Obama’s 52-46 win against Mitt Romney. However, Clinton’s narrow victory, thanks in no small part to the formidable get-out-the-vote machine built by retiring Sen. Harry Reid, helped Team Blue avenge its embarrassing loss of both chambers of the state legislature two years before. Democrats all but conceded the 2014 gubernatorial race against GOP incumbent Brian Sandoval, and uninspired Democratic voters largely stayed home; Team Red won a 27-15 majority in the Assembly, and an 11-10 edge in the Senate. But 2016 was a complete reversal, with Democrats taking back a 27-15 Assembly majority and an 11-10 Senate edge. A few days later one Republican, state Sen. Patricia Farley, announced that she was becoming an independent and caucusing with the Democrats, giving her new allies a 12-9 majority. The entire Assembly is up every two years, while half the Senate was up in 2016 and the other half, including Farley, will be up in 2018. The amateur diplomats say their goal is simply to help settle a grueling, three-year conflict that has cost 10,000 lives. “Who doesn’t want to help bring about peace?” Mr. Cohen asked. But the proposal contains more than just a peace plan. Andrii V. Artemenko, the Ukrainian lawmaker, who sees himself as a Trump-style leader of a future Ukraine, claims to have evidence — “names of companies, wire transfers” — showing corruption by the Ukrainian president, Petro O. Poroshenko, that could help oust him. And Mr. Artemenko said he had received encouragement for his plans from top aides to Mr. Putin. I fear we are witnessing a similar process unfold among many conservative intellectuals on the right. It has been stunning to watch a movement that once believed in the benefits of free trade and free enterprise merrily give itself over to a champion of protectionism whose economic instincts recall the corporatism of 1930s Italy or 1950s Argentina. It is no less stunning to watch people once mocked Obama for being too soft on Russia suddenly discover the virtues of Trump’s “pragmatism” on the subject. Trump had a packed schedule of meetings that weekend less than two weeks after the election. On the Saturday after the cocktail party, Trump met with Mitt Romney, Michelle Rhee, Betsy DeVos, Todd Ricketts, Bob Woodson, Lew Eisenberg and Dr. Patrick Soon-Shiong. On Sunday, John Gray, Kris Kobach, Wilbur Ross, Chris Christie, Rudy Giuliani, Robert Johnson and David McCormick all schlepped out to Bedminster for meetings. Trump often appears to want to include his friends in the decision-making process. New Jersey Gov. Chris Christie says President Donald Trump made him order meatloaf when they dined together at the White House this week. Sadly, he omits everybody's favorite LBJ-Pierre Salinger tale. According to this grand and ancient legend, Johnson shouted down the table to him at a small luncheon, "Pierre, you haven't eaten your beans." "Mr. President, I happen not to care for this variety of beans." "Pierre, eat your beans!" Eventually, reluctantly, the tale went, Salinger ate all his beans -- and that was the day he quit. Does the story's absence mean that it's purely apocryphal? A pity, if so. But you'd think that a one-time gossip's apprentice would give it an airing if just to deny it. A political appointee at the Department of Housing and Urban Development was fired for an op-ed he wrote before the election that criticized then-candidate Donald Trump, a source with knowledge of the situation told CNN. In an October op-ed for The Hill, Republican consultant Shermichael Singleton said Trump was taking the Republican Party to a "new moral low." "We allowed that hostile takeover to happen on our watch," he wrote. "This individual recognized a moment of great disparity in the Republican base and, like cancer, attacked and spread, consuming everything in his path." Singleton's piece criticized Trump's rhetoric about African Americans during the campaign. After the election, the 26-year-old worked with Ben Carson during his confirmation process to become HUD secretary. Singleton, who is African American, then joined the department as a senior adviser. Abrams and son-in-law Jared Kushner — after reading news reports about their meeting, which included references to Abrams' criticisms of Trump during last year's presidential campaign, according to people familiar with the decision. Though his staff was aware of Abrams' statements, the president was not — until he read news reports about their meeting earlier this week. Bitterness and joy, outrage and satisfaction, shame and pride, escapes to safe places and displays of celebration—these were just a few of the conflicting reactions that greeted the election of Donald Trump. One point lays beyond dispute: Donald Trump defied the odds, whether set by bookmakers or political pundits, or pollsters. 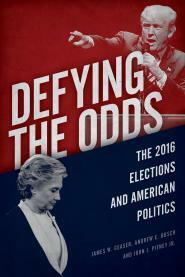 In this book—as they have for every presidential election since 1992—James Ceaser, Andrew Busch, and John Pitney Jr. revisit the race for the presidency and congressional and state elections through the short lens of politics today and the long lens of American political history. At the core of the 2016 election, they seek to understand and explain the different reasons for Donald Trump’s success at each stage of the campaign. With its keen insights into the issues and events that drove the 2016 election, Defying the Odds will be an invaluable resource for students and all political observers seeking to understand an election that was decades in the making and will continue to resonate throughout American politics for many years to come. True! But why will you say that I am ranting and raving? I don't rant and rave. Hearing? I have amazing hearing. I hear everything. Sit down. I will tell you the whole story. I have the best memory, but I don't remember when I got the idea. I have a lot of ideas, terrific ideas. That's why I won the election by the biggest margin, ever. I loved the old man. So much love. But he had this eye, a disgusting eye. [Opens his eye wide with his fingers and imitates a spasm.] "Oh, look at me, I'm so horrible!" It was like a vulture's eye, with a film over it. So like, many people were saying, you gotta do something about it. Now this is the point. The very dishonest media say "Trump's a bad man." Bad men don't know anything. But you should have seen me. You should have seen how wisely I acted. Terrific caution. Fabulous foresight. I was never kinder to the old man So nice. And every night I checked in on him, which you won't hear from the lying media. On the eighth night, I had my head in,, and the old man got up in bed, yelling --"Who's there?" Don't blame him. Crime is terrible there. People have to lock themselves in. We'll fix that, believe me. I kept still and said nothing. I have terrific silence and stillness. Then I put a pillow on his head, very very gently, you know, like one of those snore strips. Just wanted him to go to sleep, so he would close that disgusting eye. And he did. As Spicer would say, plain and simple. I knew he was okay because I could hear his heart. Did I mention that I have the best hearing? Anyway, I am the greatest real estate guy, so I knew that he would have a nice place to sleep under the floorboards. Really classy. Really clean. Like a fine-tuned machine. Then somebody leaked. They will pay for that, by the way. Three police officers came by. I had them set down and we had a wonderful meeting. I told them that we are going to have law and order in this country and support our police, Crooked Hillary never said that, did she? The thing about the old man was supposed to stay secret. I'm a big believer in privacy. I showed the police officers around the place. Melania is doing a great job with the tours, by the way. But I kept hearing the old guy's heart. Now, I believe that you gotta have heart, but this was getting ridiculous. The officers absolutely loved me. Big supporters. Then some reporters came by. Bad people, Disgusting people. They said that they heard something about the old man dying. "Fake news!" I said. The police laughed, cuffed the dishonest media, and went away. Gotta remember to comp them to a reception at Mar-A-Lago. But I kept hearing that heartbeat. So I knew what to do. I want to get along with the Russians, not fight with them. So I called Putin and told him the story. He said, "We can make problems like that disappear." And he did. Great guy. Trump just said: "I inherited a mess. At home and abroad. A mess.... no matter where you look, a disaster... we'll take care of it. I just wanted to let you know- a mess." And at home, we were facing a financial crisis that just about every credible economist said had the potential to plunge us into another great depression, an economic crisis that was producing stagnant wages, falling incomes, and a shaken middle class, and a deficit crisis that was saddling our children with a mountain of debt. That's what we inherited when we came in. -- Barack Obama, September 29, 2010. National polls show majorities in support of granting legal status or citizenship to undocumented immigrants. The problem for those calling for the enactment of liberal policies, however, is that immigration is a voting issue for a minority of the electorate. And among those who say immigration is their top issue, opponents outnumber supporters by nearly two to one. In this respect, immigration is similar to gun control — both mobilize opponents more than supporters. Purely in terms of politics and strategy, the Democrats have played immigration badly. They have allowed their position to be associated with open borders and sanctuary cities. They have based their opposition to the immigration restrictionists in terms of identity politics rather the economic benefits of well-managed immigration. This has caused them to be deaf to concerns that many voters have about the effects of immigration on wages and public services. While I do not think the evidence shows immigration has these alleged harms, the Democrats have to do better than dismiss all opposition to immigration as racism. McCarty specifically disputed the argument that Clinton’s lenient position was a net plus because it was crucial in mobilizing Hispanic voters. It was probably her underperformance in mobilizing African-Americans that hurt her most, and they are generally the group least enthusiastic about open door immigration policies. He has caused dangerous divisions among the American people because of his attitude, and the attitude he has encouraged among his followers, that there can be no honest differences of opinion with him. Either you must follow Senator McCarthy blindly, not daring to express any doubts or disagreements about his actions, or in his eyes you must be a Communist, a Communist sympathizer, or a fool who has been duped by the Communist line. Congressional Record (bound), December 1, 1954, 16268.